With so many options in the Toronto Fringe Festival, it’s sometimes hard to get one’s mind beyond judging by a title, even when it includes a nod to Stanley Kubrick. Fortunately, you’re a click away from hearing about Katharine McLeod‘s solo show, which could open and even elevate your mind. My High-Heeled Life: Or, How I Learned to Keep Worrying and Love My Stilettos may encourage you to be just as unapologetic about the things you love – and there’s a chance that you’ll add this show to that list. 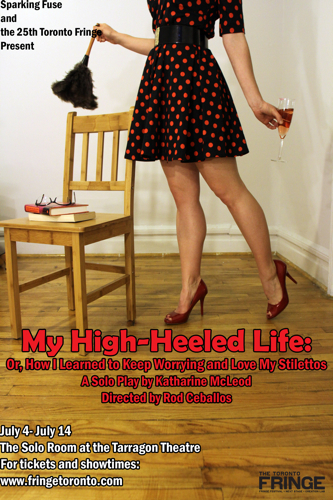 This entry was posted in Fringe 2013, New Plays, One-Person, Theatre and tagged high-heels, katharine-mcleod, solo, toronto, women. Bookmark the permalink.